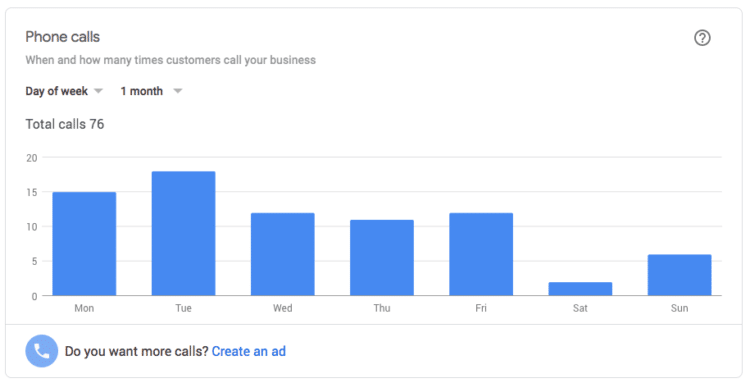 Google My Business: What is GMB and Why You Should Use it? How Do You Optimize GMB? 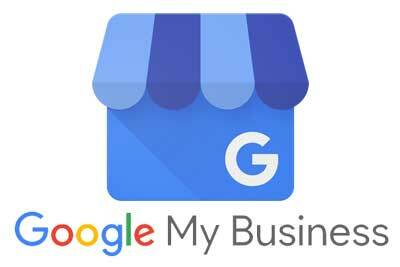 If you have a business, you should have a Google My Business Account. It’s that simple. This article is a great starting point for any business owner wanting to learn more about GMB, including how to set-up your GMB, verify it, and optimize it. GMB is a robust directory that Google created that presents results on the branded search of your business. Typically it appears on the top of a mobile search. On desktop, a GMB listing appears in the top right hand corner of the screen. Google is the world’s #1 search engine, and this isn’t by a small margin. Google is also a little bit narcissistic (we mean that in a good way). Google trusts and prefers it’s own platforms and tends to present those first in search results and uses a large amount of digital real estate on the homepage of search results to do so. This is definitely the case with Google My Business search results. When users search, you can now, through GMB, own a large chunk of real estate on the home search page results. Because it is so large, visible and trusted, the GMB listing is often where searchers are going to click. They don’t even have to leave the first Google results page, and searchers can be contacting your business with a click or a call. 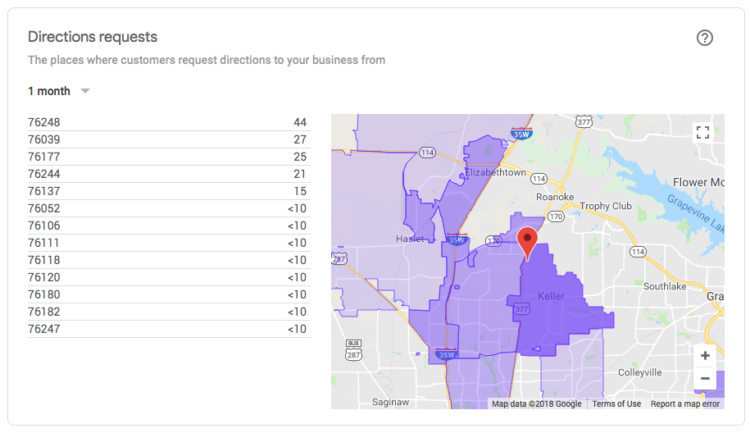 Google is trying to connect searchers to providers that are very nearby. This way of presenting answers is called hyper-local search results. They know someone searching in Fort Worth, TX probably doesn’t want to get results back from New York or even Waco, TX for that matter. 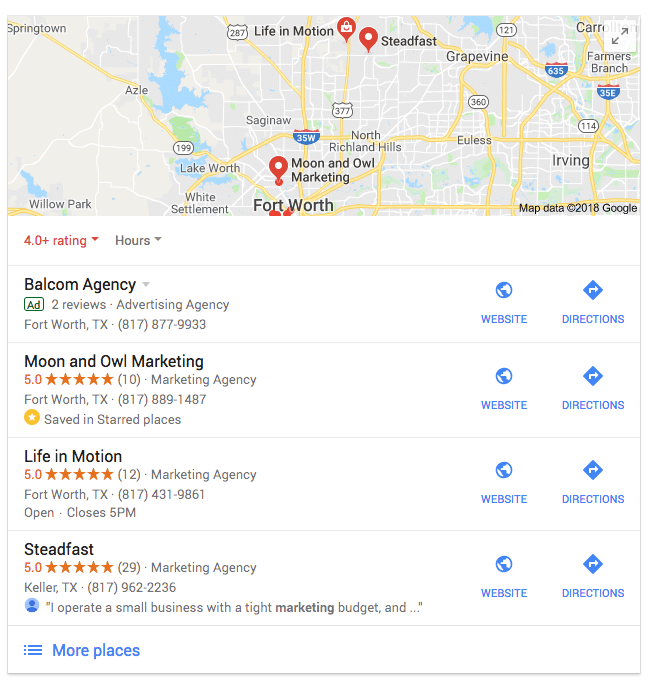 The way Google is accomplishing this hyper-local search is by utilizing the Google My Business and Map Pack results it shares when someone completes a search. As hyper-local search becomes more rewarded, it’s important you are in the game. The good news is that it’s not that hard with the GMB dashboard. 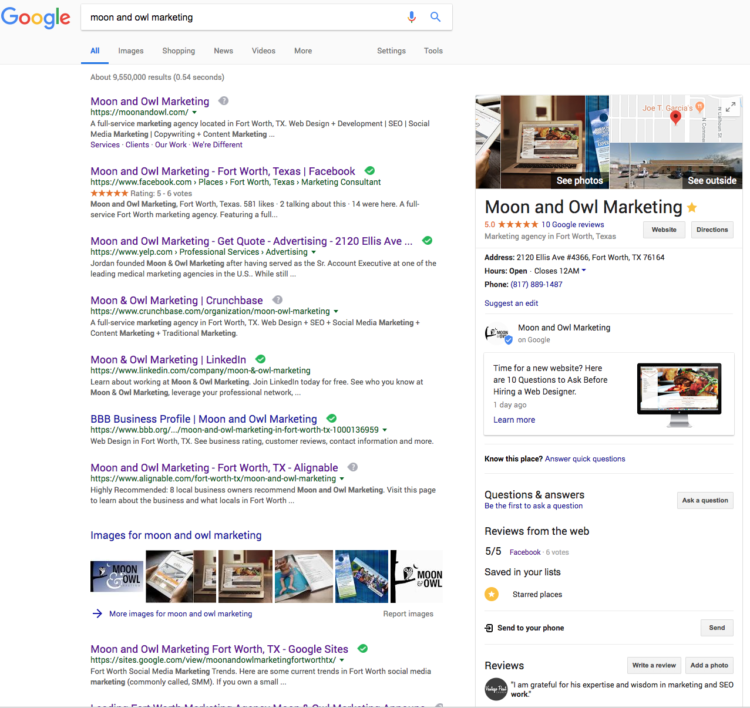 Since this Google online eco-system operates differently than a traditional webpage, there are some important things to make sure you have in place on your GMB listing. First, make sure your business has a GMB listing that is verified. Visit https://www.google.com/business/ and click “Start Now.” Google will walk you through setting up your business. Note: You’ll need to make sure the address you enter for your business can receive a postcard at that address. Google will mail you this card with a code on it which you then need to enter at the URL above. Warning: Be on the lookout for it. Tell your mail person/room that it is coming because it can often get tossed as it appears to be junk mail. If you find out your business is already listed, there are instructions to gain ownership of the GMB account at that link, as well. How Can I Improve my GMB Results? There are some GMB search engine optimization methods you can use to promote your GMB listing. 01. Make sure your information is correct. A. Double-check your phone number and address. B. Enter a description of your business. Remember to use keywords people would use when searching for services or products you provide. C. Enter the services your business offers. Again, be keyword focused while providing the user the clear benefits you offer them. People care more about what you do for them than what you do. Also, differentiate or die applies here. 02. Make sure there is not a duplicate listing for your business. For example, it would be very easy to see a listing for Moon and Owl Marketing along with Moon & Owl Marketing. GMB sees those as two different entities. 03. Let GMB’s version of your Name, Address and Phone be the official version. As subtle as this sounds, it’s essential for all of the online citations of your NAP (Name, Address, Phone) to match your GMB listing verbatim. So if GMB calls it Suite 120, use that everywhere. If Google auto-populates STE 120 into your GMB listing, do likewise across the web every time you list your address. A higher exact-match correlation between online listings means better rankings. Different versions of your NAP confuses Google. 04. Upload lots of photos and videos for your business. Think broadly, incorporating building shots, staff shots, product shots, event shots and more. Continue adding pictures and/or videos on an ongoing basis. Freshness helps. 05. Garner positive reviews for your business listing. Get a ton of legitimate 5 Star reviews. This not only increases your search presence, but it also helps build credibility with searchers. Remember, ReviewGrabber can be a tremendous help in this, with a simple text to review feature. 06. Use the new post feature on GMB. Now you can push our relevant content, offers and information. You can know use your GMB like you would another social media platform, but think a wee bit differently about it. Don’t do fluff or what we call soft-posts on GMB. Save those for Facebook. People are searching and want answers and benefits. Remember to renew the post every 7 days as it “dies” at that time. 07. Check your listing regularly. One different thing about GMB is it is sort of a hybrid between a social media platform you own (like Facebook and a public platform (like Yelp). This means users can suggest edits for your business that Google might accept even if they aren’t 100% accurate. You’ll want to keep an eye on things just in case. You can generally override these edits, but note, not reviews. You can only respond to a review, not delete them.) Again, click to learn to better manage your reviews and reputation. The map pack is the three maps that appear when specific searches are completed. Example: Plumber Fort Worth, Plumber Near Me, etc. You’ve seen it before but maybe didn’t realize what it was called. The Map Pack is an outstanding place to rank because Mobile Users only have to click the listing to call, no dialing needed. We have gathering evidence that shows increasing your review counts (and other GMB SEO work) has a positive effect on your Map Pack ranking. We recently had a client use the ReviewGrabber program to go from a 31 3-star overall rating to 142 glowing 5-stars. Interestingly enough, her Map Pack rankings started jumping through the roof, as well. May of their keyword + city modifiers now rank either first or second in the Map Pack. How Do I Track My GMB Results? 01. How many times did my GMB get seen? 02. How many called through my GMB? You’ll be able to determine how many phone calls occurred because people used the click to call function on their phone (or if they have they desktop connected to be able to call via Facetime, etc.). 03. How many people clicked through to my website? See how many searchers saw your GMB listing and clicked through to your website. 04. How many people asked for directions and from where did they make the request? 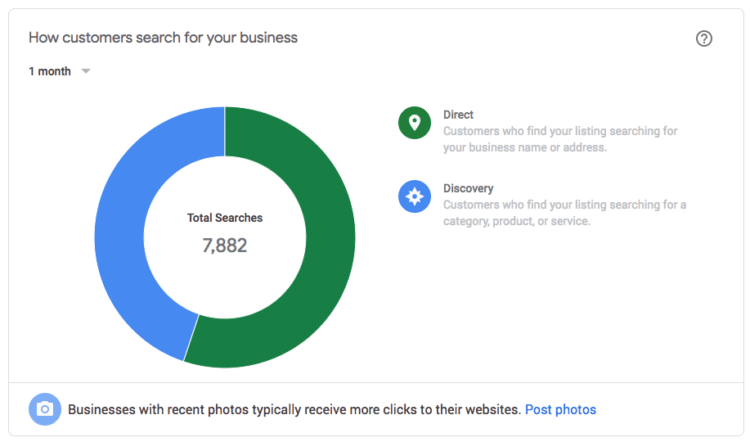 Armed with these insights, you can start to measure the results on your new Google My Business optimization efforts. There is also a GMB app for iOS and Android that can help you keep tabs on what is happening with your GMB account. Want to learn more tips for your GMB optimization? 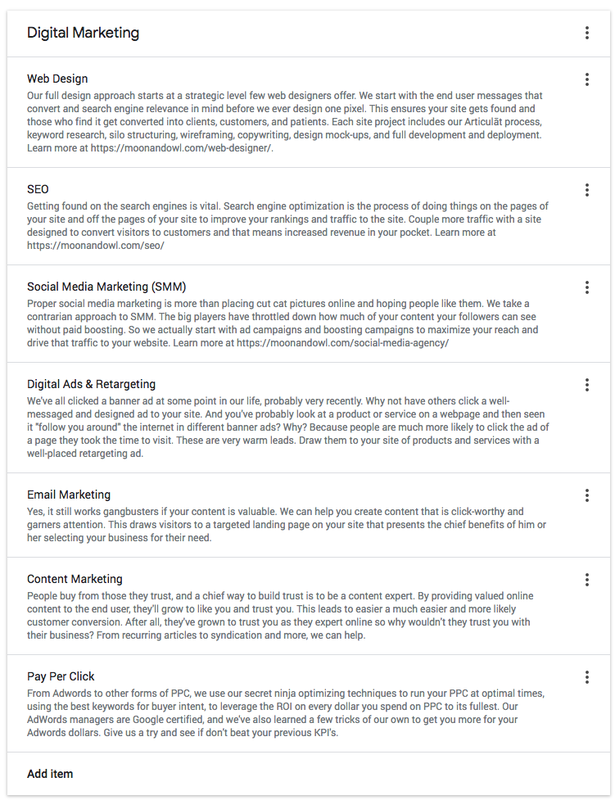 Check out this article by https://moz.com/blog/how-to-optimize-your-google-my-business-listing. 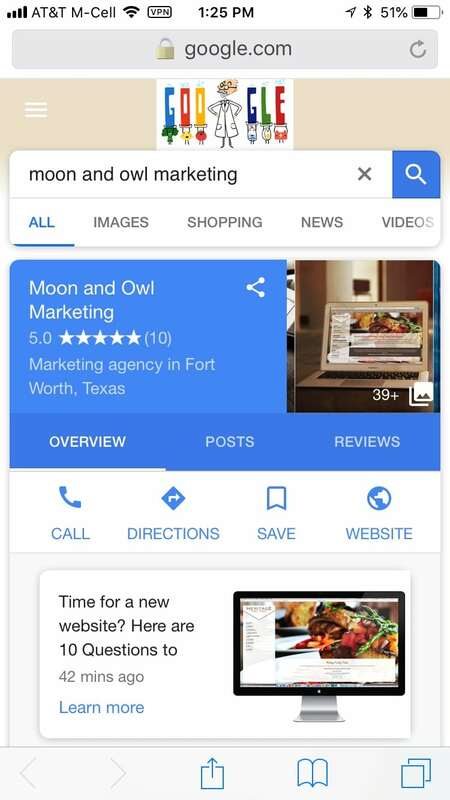 Want Moon & Owl Marketing to handle your Google My Business listing and optimization for you so you can concentrate on running your business? We’ll even show you the monthly results. Call us at 817-889-1487 to schedule a free Google My Business consultation.